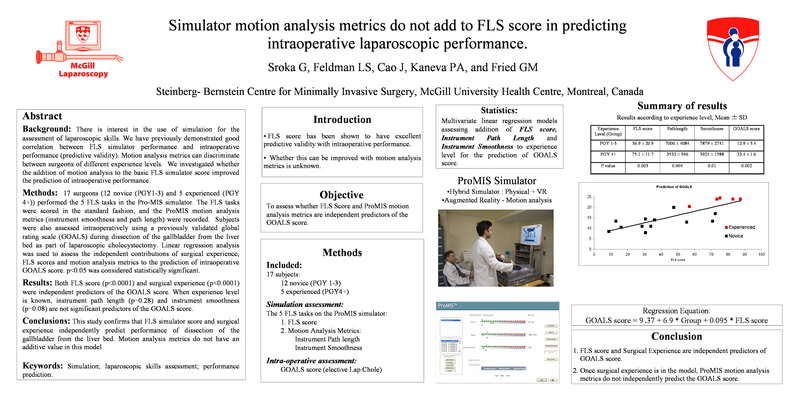 Simulator motion analysis metrics do not add to FLS score in predicting intraoperative laparoscopic performance. Background: There is interest in the use of simulation for the assessment of laparoscopic skills. We have previously demonstrated good correlation between FLS simulator performance and intraoperative performance. Motion analysis metrics can discriminate between surgeons of different experience levels. We investigated whether the addition of motion analysis to the basic FLS simulator score improved the prediction of intraoperative performance.